Have you ever been to New Orleans? New Orleans also known as "The Big Easy" or "NOLA" is filled with unique culture, history, scrumptious French-inspired Creole and Cajun food, live jazz, street performers, and many other things. This city is a great place to visit with lots of activities and things to do and see for the whole family. If you are planning to visit New Orleans, you should stay at Dauphine Orleans Hotel. This charming and quaint historic hotel is located in the heart of the French Quarter neighborhood and a block away from the famous Bourbon street. This boutique French Quarter hotel is fully renovated hotel that captures the historic aura of New Orleans with its original 19th-century cypress structures and portraits of Victorian madams. Rooms are individually decorated with contemporary furnishings and offer 42-inch flat-screen TVs with cable channels and coffeemakers, plus free bottled water and WiFi. Some rooms have original architectural details, balconies and Jacuzzi tubs. Perks include an outdoor saltwater pool and a fitness room. My family and I stayed in the spacious Premium Main House Guest Room that features two double beds with a balcony overlooking Dauphine Street. The beds are Tempurpedic and so comfortable! The room was clean and maintained well with soothing lighting. A decent and clean marble bathroom with plenty of towels and washcloths. Their complimentary amenities is superb which include Wi-Fi, deluxe continental breakfast in the historic Audubon Room, welcome drink at May Baily’s Place, bottled water, afternoon tea, local calls and valet parking in the rare on-site garage. The complimentary continental breakfast was excellent! They have waffles, hard boiled eggs, sausage, grits, biscuits, muffins, fruits, cereal, juice, coffee, and more. 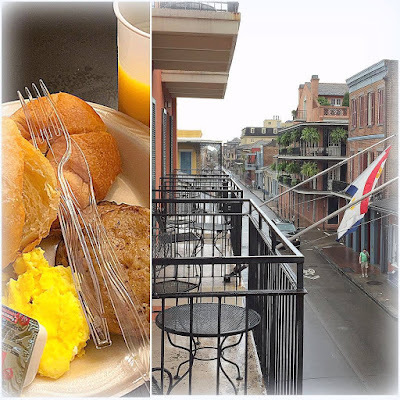 I personally enjoyed eating breakfast on our private balcony watching people and horse carriage pass by with a view of the historic French Quarter. It was an awesome experience! Don't forget to check out the legendary May Baily's Place! May Bailey's Place is a cozy on-site bar that was once a popular bordello at the turn of the 20th century in the famed Storyville District. Arriving guests are greeted with a complimentary beverage from the bar, and customers always have access to free popcorn and a cozy couch. The Dauphine Orleans Hotel is also infamous for its ghost sightings of Civil War soldiers and patrons of May Bailey's Place. The hotel staff delivered impeccable service and not to mention they made us feel truly special! Thanks Dauphine Orleans Hotel for the warm hospitality and for going above and beyond. Our overall experience during the holiday week was fantastic! We would highly recommend this hotel to everyone! For more details or would like to book a room, you should visit dauphineorleans.com. Don't forget to like them on Facebook or follow them on Twitter for updates and promotions. So what are you waiting for? Disclosure: We received a two-night complimentary accommodation to stay at Dauphine Orleans Hotel in New Orleans in exchange for a fair review. Nice looking hotel. You actually showed one of the things that I look for when i stay somewhere - the gym. New Orleans is a great place to visit and having a good hotel to stay in makes it even better. I have always wanted to go to NOLA! This sounds like a lovely place to stay if I ever make it that way. I love New Orleans! I think I have stayed there once a long time ago. I'd love to go back to New Orleans with my daughter. This sounds like a great hotel to stay at. Love the old school style of the hotel. I like the beds, they look so cozy and comfy! It sure would be nice to stay here! Beautiful hotel! Love all your photos and such a great review. New Orleans is a gem, I can't wait to visit again. Would love to visit, just don't know when! I love the balconies on the hotel. Looks like a nice hotel. That is pretty! I love New Orleans ( have not been there but I fell in love with the place from watching The Vampire Diaries ) and I really want to see the place in one of my future trips. Thank you for the recommendation on the hotel. I'll definitely consider it when I go on a trip. I have never been to New Orleans but isn't this hotel just a little slice of heaven? Love the coziness of this hotel! The rooms and all the amenities are really great! I'll keep Dauphine Orleans hotel in mind if and when I get to visit New Orleans! This looks like an incredible hotel! I have always wanted to go to New Orleans. I will have to keep this in mind. Sitting out on the balcony would be one of my favorite parts. What a beautiful hotel with historic charm. I would love to go there with my hubby, I'm sure he would love this place. Woah. This place looks awesome, I'm going to add this on my bucket list. I so want to visit New Orleans one day. I have a friend that tries to go every year because she loves it so much! I have never been to New Orleans! But, your post makes me want to go. That looks like a beautiful hotel to visit! I would love to visit it someday! Love the pictures you shared. I have family who live near New Orleans. They used to send me big boxes of necklaces around Mardi Gras. I would love to visit one day. Wow I'd love to take my wife here some day. What a beautiful hotel too! Happy new year and best wishes to you in 2016! What a beautiful hotel, looks like a great place to visit and unwind.